The term “complainant” means the student, employee or third party who presents as the impacted party of any Prohibited Conduct under this policy, regardless of whether that person makes a report or seeks action under this policy. The term “retaliation” is defined as any form of intimidation, threats, or harassment by an individual accused of misconduct, or by persons acting in support of or on behalf of the individual against whom a grievance has been filed. Acts of retaliation alleged to have been committed by a student are considered to be a separate violation of the Student Code of Conduct, in addition to any other alleged misconduct contained in a complaint against a student. The term “Conduct Officer” refers to the staff person responsible for managing the student conduct process. The term “conduct file” refers to the creation of a record with the university when a student is referred to the Student Conduct process. The contents of this file include the outcome of a conduct hearing, referrals to a restorative process, findings of responsibility for a code violation and/or any institutional sanctions assigned in the Conduct process (see Sanctions, Article IV: C). A conduct file is a part of a student’s educational record. Please refer to the Student Code of Conduct Article IV: F: Release of Conduct Information for information on the release of a conduct file. Conduct files typically do not become part of a student’s academic transcript. The term “restorative processes” refers to processes that emphasize repairing the harm caused by a respondent to impacted parties, victims and the community. Participation in restorative processes is voluntary for all parties involved. Restorative processes are utilized when a respondent (student or organization) accepts responsibility for their actions. Any unauthorized use of electronic or other devices to make an audio or video record of any person while on University premises without his/her prior knowledge or without his/her effective consent when such a recording is likely to cause injury or distress. The storing, sharing, and/or distribution of such records by any means are also prohibited. Leaving children under the age of 16 unattended or unsupervised on campus grounds. University conduct policies pertaining to academic dishonesty are part of the Student Code of Conduct. However, the appeal process for a finding of academic misconduct is under the purview of Academic and Student Affairs. When a faculty member reports an acts of academic dishonesty to the Conduct Officer, he/she may ask that institutional sanctions (refer to Section IV. B.) be applied. At his/her discretion, the Conduct Officer may recommend and impose sanctions in any reported case of academic misconduct against a student. The University views the conduct process as a learning experience that can result in growth and personal understanding of one’s responsibilities and privileges within the University community. It is not intended to be a substitute for civil or criminal legal proceedings, and is designed to provide a fair evaluation of whether or not a student has violated University policies. Formal rules of evidence do not apply in the University’s conduct process. The University uses a preponderance-of-evidence standard when determining responsibility for alleged violations of the Student Code of Conduct. A preponderance of evidence means that what is alleged to have happened is, more likely than not, what actually happened. This shall be the standard of proof used in all conduct proceedings under this Code. The Conduct Officer may notify the student or organization of the complaint. Once the student is notified of the complaint, he/she has the opportunity to schedule a conduct hearing with the Conduct Officer or designee to discuss the situation. If the student fails to make contact with the Conduct Officer/designee within the time frame specified in the notification, the Conduct Officer/designee may make a decision in the student’s absence on the next steps in the process or place a registration hold on the student’s account. Prior to the conduct hearing, the Conduct Officer shall present to the respondent or responding organization, in writing, a statement of the allegations, the charges they would support and the potential consequences in the event that student is found responsible. The student will be responsible for scheduling the conduct hearing with the Conduct Officer. In the event of extenuating circumstances, the Conduct Officer may determine that the hearing shall take place via telephone or through a written process. The Conduct Officer will notify the respondent in writing of this determination. The complainant and the respondent have the right to have any advisor they choose, at their own expense, to be present during any meeting or conduct hearing. The advisor may be an attorney, with notification of this information to the Conduct Officer. The complainant and/or the respondent is responsible for presenting his/her own case and, therefore, advisors are not permitted to participate in any meeting or hearing within the conduct process unless the University legal counsel specifically advises otherwise. The respondent and/or the complainant will notify the Conduct Officer at least 5 business days before the meeting or hearing of the name, address and telephone number of the advisor. In certain cases, University Legal Counsel may be present. If the advisor selected by the complainant or respondent is also a witness to the complaint, the student must identify an alternate advisor, as a witness may not also be an advisor. The respondent may present witnesses pertaining to the alleged incident. Similarly, the complainant may present any witnesses prior to the conduct hearing. During the conduct hearing, if the Conduct Officer determines that the restorative process may be appropriate, the conduct officer will offer it as an option to the respondent and address any questions the respondent may have about the process. If the respondent accepts responsibility for the alleged prohibited conduct and agrees to and completes the agreement developed during the restorative process, the matter will be considered resolved and no further action will be taken. A professor may issue a permanent grade F as a result of academic dishonesty that results in a failing grade in the class or is so flagrant as to warrant it. The permanent F is a grade not a sanction for purposes of this Student Code of Conduct. When a faculty member gives a permanent F, they are required to file a report with the Dean of Students Office, which will determine if a sanction is to be imposed for the incident. Students who wish to appeal a permanent grade of F must do so by following the Grade Appeal Policy outlined in the University Catalog. Educational records are the comprehensive records kept for all students and are subject to federal laws, including the Family Educational Rights and Privacy Act (FERPA). A student’s conduct file, created when any alleged violation of the Student Code of Conduct is reported to the Dean of Students Office, is a part of a student’s education record. As a result, these records are kept confidential in accordance with this law. Access to any student’s disciplinary file shall be governed by provisions of FERPA, and the Campus Security Act (or “Clery Act”) as amended. A written waiver signed by the student is required for release of disciplinary records to third parties not otherwise mandated by relevant law. Metropolitan State University of Denver prohibits sexual misconduct in any form, including sexual assault or sexual abuse, sexual harassment, and other forms of nonconsensual sexual conduct, including stalking and electronic harassment. Forms of intimate partner violence, such as domestic and dating violence, are also prohibited under this policy. Retaliation in any form for reporting such sexual misconduct or for cooperating in a sexual misconduct investigation is strictly prohibited and will be addressed as a separate violation of the Student Code of Conduct. Students, faculty, staff, and visitors should be able to live, study, and work in an environment free from sexual misconduct. It is the policy of MSU Denver that sexual misconduct in any form will not be excused or tolerated. This policy is promulgated under Title IX of the Education Amendments of 1972 (Title IX), 20 U.S.C. §§ 1681 et seq., and its implementing regulations, 34 C.F.R. Part 106; Title IV of the Civil Rights Act of 1964 (42 U.S.C. § 2000c). Because this policy is part of the MSU Denver Student Code of Conduct, all policies, procedures and definitions in the Student Code of Conduct apply to this policy. Physical Assault is threatening or causing physical harm or engaging in other conduct that threatens or endangers the health or safety of any person. Physical Assault will be addressed under this policy if it involves Sexual or Gender-Based Harassment, Intimate Partner Violence, or is part of a course of conduct under the Stalking definition. Intimate Partner Violence includes any act of violence or threatened act of violence that occurs between individuals who are involved or have been involved in a sexual, dating, spousal, domestic, or other intimate relationship. Intimate Partner Violence includes “dating violence” and “domestic violence,” as defined by VAWA. Consistent with VAWA, the University will evaluate the existence of an intimate relationship based upon the Complainant’s statement and taking into consideration the length of the relationship, the type of relationship, and the frequency of interaction between the persons involved in the relationship. Intimate Partner Violence may include any form of Prohibited Conduct under this policy, including Sexual Assault, Stalking, and Physical Assault (as defined above). The MSU Denver Counseling Center may be reached by calling 303-556-3132 or by visiting Tivoli 651 during the hours of 8 a.m.-5p.m. Campus counselors are available to help you free of charge and may be seen on an emergency basis. If you need assistance between 5 p.m.-8 a.m., or on the weekends, you may contact the After Hours Mental Health and Victim Assistance Crisis Line by calling 303-352-4455. As an MSU Denver student, you also may contact the Phoenix Center at Auraria for confidential victim’s assistance to the extent possible by law. You may call its 24/7helpline at 303-556-CALL. It can assist in reporting and connect you to both on-campus and local resources. The Phoenix Center at Auraria provides advocacy services for victims, including accompanying them to the hospital to receive an examination and evidence collection, court advocacy for orders of protection or through criminal proceedings and advocacy through the reporting process. 1) Dean of Students Office - This office is responsible for investigating any allegation of sexual misconduct where the respondent (accused) is a student. You can expect to have incidents of sexual misconduct taken seriously and responded to quickly. Incidents will be investigated and properly resolved through administrative procedures as described in the conduct process. If you request confidentiality, MSU Denver may be limited in its ability to take disciplinary action against the alleged harasser. 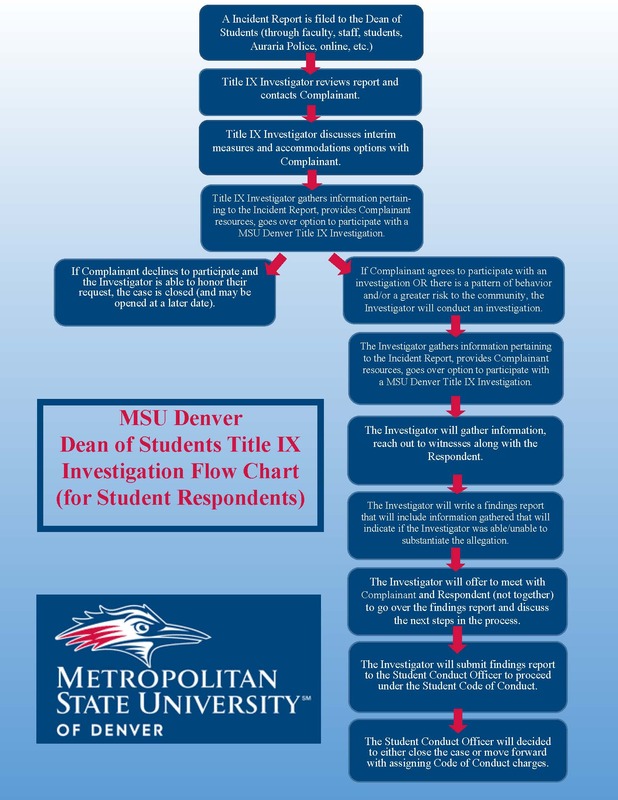 Moreover, if you request confidentiality, MSU Denver must evaluate your request in the context of its commitment to provide a reasonably safe and nondiscriminatory environment for the campus community. Thus, MSU Denver cannot ensure confidentiality of a complaint. Information will be shared to the extent necessary for MSU Denver to pursue other steps to limit the effects of the alleged harassment and prevent its recurrence. To discuss questions or concerns related to confidentiality prior to reporting an incident to the University, you may contact the Dean of Students Office and ask to speak with Title IX staff. To report to the Dean of Students Office, a student may visit the Office of Student Engagement and Wellness in Tivoli 311 or call 303-556-3559 to speak with the Title IX Investigator. Students may also file a report online at www.msudenver.edu/conduct. 2) Auraria Police - The Dean of Students Office can assist you in reporting any incident of sexual misconduct to the Police. An incident may be reported to MSU Denver or the Auraria Police Department even if the victim/survivor has not decided to take legal action. If the assault took place off campus, Auraria Police or the Dean of Students Office can assist you in contacting the police that have jurisdiction over that area. Auraria Police may be reached by calling 911 from any campus phone or by calling 303-556-5000 from any non-campus phone. 3) Title IX Coordinator/Equal Opportunity - If your complaint involves a faculty or staff member, you would file a report with the Office of Equal Opportunity to be investigated and properly resolved. You can contact the Office of Equal Opportunity in the Student Success Building, room 440 or by calling (303) 556- 4746. As this process is part of the student conduct policy, it is eligible for appeal under Article IV F of the Student Code of Conduct. Both parties are eligible to appeal. If one party chooses to appeal, the other party will be notified so that the appeals may be submitted simultaneously. The decision by the appellate officer is final. MSU Denver prohibits retaliation against an individual for making a complaint of sexual misconduct, for resisting such behavior, or for otherwise using or participating in the grievance process. Prohibited behavior includes any form of intimidation, threats, or harassment by the individual accused of misconduct or persons acting in support of or on behalf of that individual. Acts of retaliation are a separate violation of the Student Code of Conduct.